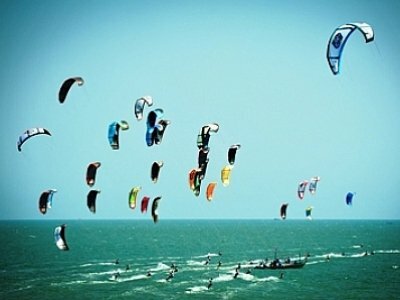 PHUKET: Organizer’s of the Phuket King’s Cup Regatta have announced that the 2011 event will include an invitation-only exhibition of kiteboarding hosted by Kiteboard Tour Asia (KTA). The introduction of such an exciting sport to this year’s event is part of the Regatta’s 25th anniversary celebrations and in recognition of kiteboarding’s development and popularity as a sailing discipline. Kevin Whitcraft, President of the Phuket King’s Cup Regatta Organizing Committee, expressed his enthusiasm for the event’s inclusion on the Regatta’s schedule. “We’re delighted to welcome an exhibition event by Kiteboard Tour Asia at this year’s Phuket King’s Cup. This is a bold step for us in terms of broadening the Regatta, and we hope this new element will have very strong appeal to kiteboarding enthusiasts and a younger sailing audience,” explained Kevin. As many as 20 kiteboarders are expected to take part, combining talent from Asia and International pro riders from the World Tour. Two-time Asia Champion from Thailand, Narapichit “Yo” Pudla, will headline the demonstration spectacle alongside two-time Asia Freestyle/ Race Champion and two-time Japanese Freestyle Champion Aya Oshima. Other big names from the international circuit include: Ken Nacor, Philippines Champion and Asia Number 2; Beijing Olympics Silver Medalist (windsurfing) Ho Chi Ho; Turkish KTA Champion and Turkish Freestyle Champion Taner Aykurt; and Kathryn Bogwardt, 2010 and 2011 KTA Ladies Champion. For more information, visit www.kingscup.com. Pick up a copy of next week’s Gazette for a full report on kiteboarding in the King’s Cup Regatta. The Phuket Gazette is proud to sponsor the 25th King’s Cup Regatta.